Rare Dinosaur Species Unearthed on the Close! As The Real Mary King’s Close prepares for its upcoming redevelopment works, an “eggciting” discovery has been made suggesting that the Close dates back further than originally thought. Following a thorough excavation and inspection of the area where the eggs were discovered, Dr Lipra Folos, a local palaeontology expert, was able to confirm that the eggs are of the Aprilfooliosaurus species which would have inhabited the city of Edinburgh alongside other species such as the Porcus Volaticus. Fossilisation of the eggs in the underground warren of hidden streets has resulted in their shells turning a pastel shade. 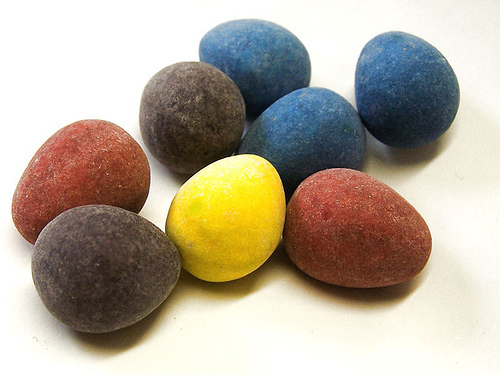 The outward appearance of these eggs is not too dissimilar from the candy coated ones seen lining supermarket shelves up and down the country in the run up to Easter. Due to the delicate nature of the eggs, they will be on display for a limited time only before being sent off for further scientific analysis. The discovery comes as The Real Mary King’s Close extends its opening times in the lead up to the Easter break and beyond. From Friday 27th March until Saturday 31st October tours will run from 10am-9pm. Pre booking is highly recommended; advance bookings can be made by calling 0845 070 6244, online any time up to 48 hours in advance at www.realmarykingsclose.com or in person at The Real Mary King’s Close. The Real Mary King’s Close is a Continuum Heritage Attraction run by Continuum Attractions. The site is currently undergoing a £500,000 development project due to be completed in June 2015. Continuum Attractions offer a host of cultural visitor attraction experiences across the UK, from the hallowed cobbles of Coronation Street to Portsmouth’s Iconic Spinnaker Tower.